At Bond No. 9, we’ve built our reputation on New York-centric scents that capture and are named for the spirit of our great city’s legendary and up-and-coming neighborhoods—from Riverside Drive to Nouveau Bowery to Coney Island. But concurrently, we’ve lately begun designing eaux de parfum that are metro-accented odes to our favorite fragrance notes. Simply put, our mission is to New York-ify these legendary scent notes, composing blends that bring out their metro bona fides. First came New York Oud, a homage to the Eastern-world wood, which we modernized and energized for our fast-paced, multifarious cityscape. Now comes a shared male-female blend which celebrates a very different aspect of New York: its seductive, sophisticated edge. Introducing New York Amber, whose powerful but quietly sensual key ingredient is a musky, earthy, honey-like tree resin with a haunting liquor-gold color that has also made it an enticing gemstone. Found far away, along the shores of the Baltic Sea, amber nonetheless has all the sought-after New York smarts—being as smooth and flawless as twilight on the Hudson, as cocktails at a skyscraper aerie, or a Gershwin rhapsody in gold. One of the most ancient ingredients in the perfume repertory, amber was so prized by the Greeks that they associated it with the Sun God. Notes include bergamot, saffron, nutmeg, white peppercorn, rose, jasmine, osmanthus, oud, amber and sandalwood. Bond no. 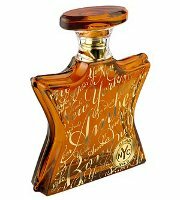 9 New York Amber is available now at Saks Fifth Avenue, in 50 ($260) or 100 ($330) ml Eau de Parfum. It’s a darned tempting bottle, too — might be my favorite of their recent bottles. Oh my! I’ve been on an amber kick recently and this one sounds fabulous. Fabulously priced too! I assume you mean “priced as though it is fabulous” — they sure aren’t cheap! LOL! No, more that that is a fabulous amount of money for a Bond fragrance. I like bond scents, and I love amber, in all forms and was a huge fan of their NY Oud (not enough of a fan to purchase though, 300 is a bit steep). But that’s why dacants and splits are so popular and help keep my budget in (relatively) good shape!